The importance of FIT in the pictures. Nothing should be more clear – he looks way more muscular and in shape with clothes that are fitted. Now, on to the snaps! 1) The pants are DOUBLE pleated (who even knows why they exist?!). 2) The shirt is basically a man blouse – too big and pillowing out of his pants. 3) No overly square toe shoes. Ever. 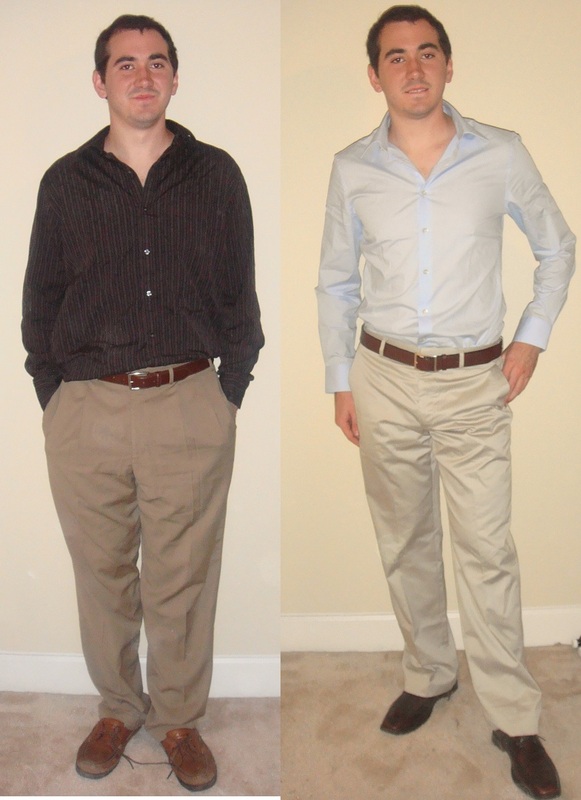 1) The pants are flat front and fitted well, making John look slimmer and in shape. 2) The shirt fits his shoulders much better and is slimmer on the waist. This prevents the aforementioned pillowing and makes him look muscular. 3) The shoes are a nice brown and are pointed, not square. 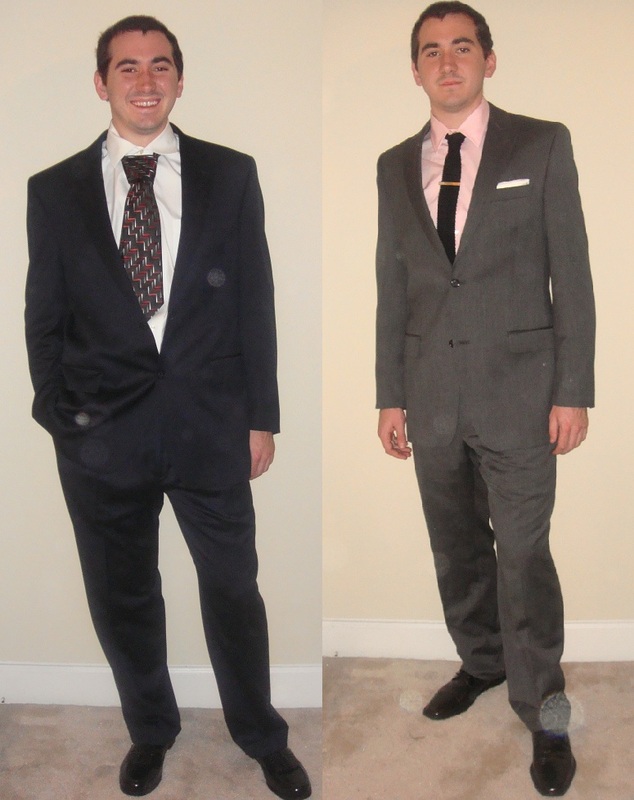 "Before" Business Formal / "After" Business Formal"
1) The suit jacket does not fit him well. 2) NEVER button the bottom button. 3) The tie is tied in a full Windsor knot. With his point collar, he should tie a four-in-hand. 4) The tie is so large that it takes up so much of his chest, creating a really weird look. 1) This suit is a very nice grey color and fits him so well. The shoulders are a much better fit, the arms are slimmer, and it tapers at his waist when he buttons it. 2) The pants are slim and flat front. They also create a nice break on the shoes. 3) The shoes are pointed and polished. You can never go wrong with black and grey. 4) The pink shirt goes perfect with the grey. 5) The tie is black, knitted, and slim – perfect for fall. 6) The tie bar and pocket square pull the whole outfit together. Accessories are essential. The devil is in the details. Another crucial point here is that it does not cost more to dress well than it does to dress badly. All it takes is a little more thought and a little more vigilance in picking the right clothing. This entry was posted in Fashion, From Drab to Fab and tagged Color, Drab to Fab, Fashion, Fit. Bookmark the permalink. I remember when we did this to JD. A life-changing moment when he said “Instead of asking why I should do this, WHY should I NOT be the best dressed man in the room”. Brilliant. Thank you! Please pass the blog along! I love how John is your model. Love the blog as well! In the business formal, not only is the tie way too wide, but he wears it far too short. A proper tie should just barely touch the belt. Cool article.. if I met both of them side by side, the better dressed easily gets +10 respect.